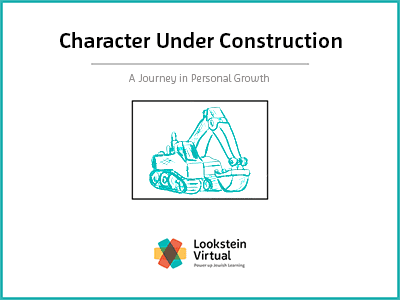 This course will bring students on a personal journey of character refinement and development. What do we do when life throws us a curveball? How do we react to the bumps that we encounter on our life journey? What is true happiness, and how do we achieve it? How do we make meaning of our lives? We will explore approaches to limitations, forgiveness, meaning of life, happiness, and more by examining both ancient Jewish texts and contemporary examples from around the world. Each example will compel us to reflect on our own experiences and strengthen our character.